When Walthers introduced a Pullman Standard coal gondola in its Mainline series earlier this year, it seemed like the perfect candidate for unit train service on the CWE. A quick check with Stuart Thayer and Anthony Hardy showed that the paint scheme was accurate and that, indeed, these cars were produced in the mid-1970's. Stuart provided the photos of the cars below which show them in almost new condition. That was all the confirmation I needed- I immediately ordered 18 of them. When they arrived, I was impressed with the detail and the quality of the paint job. The only thing missing was the ACI label, so I added them to all of the cars. Based upon the photos above, it was apparent that very little weathering would be needed to accurately depict these cars in service in the summer of 1976. The first step was to mask the sides and paint the bottoms of the cars with Rust-Oleum camouflage, which is a dark, dirty brown colored paint that is plastic compatible and dries perfectly flat. I also sprayed the trucks and wheels with the same paint. Next, I applied Sophisticated Finishes iron paint to the interior of the car as can be seen in the photo below. Once the iron paint had dried, I applied the rust solution to the interior of the car. I wanted just a hint of rust, as these cars were turned between the mines and the power plants fairly quickly and the interiors didn't have much of a chance to rust. The look I was trying to achieve can be seen in the photo of the interior of a CPOX hopper that Anthony sent me. Unfortunately, the Sophisticated Finishes rust solution had added too much rust by the time the solution dried enough to spray it with Dullcote. However, this actually turned out OK as the subsequent weathering steps toned it down significantly. The next step was to make a wash of acrylic ivory black and Windex with a small amount of burnt umber. To this I added some MIG gun metal pigment in order to get the effect of the polished steel that is seen prior to the initial coat of rust forming on the sides and bottom after the load has been dumped. This solution was applied on the bottom of the gon, thinned a bit, and then applied to the sides. The last step was to use Anthony's trick of adding real coal to the bottom of the gon and dumping it out to either side. This leaves just enough coal dust on the sides and in the bottom to depict what is left from the last load. The photo below shows the final results. Once the cars are placed in service, a little more coal will be added to the bottom of the car along the sides. The last step was to added a light coat of weathering powder to the truck sides frames and some washes of burnt umber and ivory black acrylics to the wheels. The photo below shows the car at this point. It took much longer than I anticipated, but the changes to the scenery around North Pierce are finally finished- at least for now. Here's a shot of the overall scene. And here's a shot of how the area looked last December before the changes began. The small stream is intended to look like what one might find in the woods in the middle of summer with very little flow. in the photo below you can see how the stream curves around to the left behind the trees. 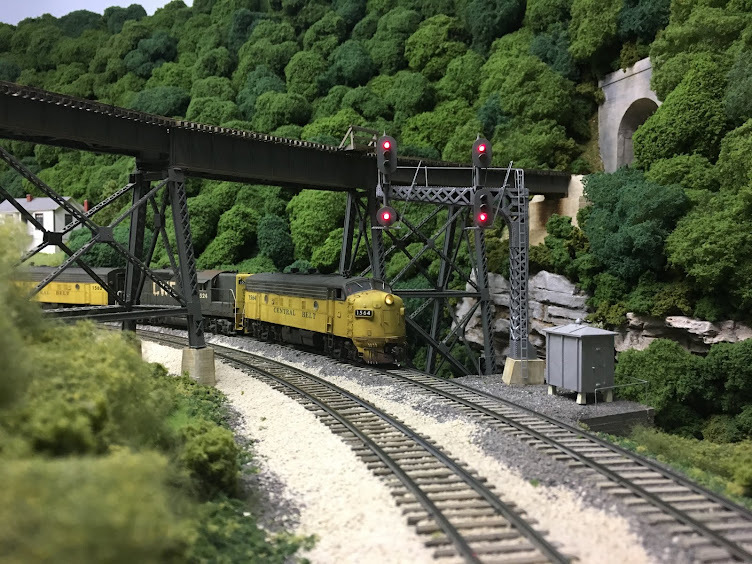 And finally, a couple of rail fan shots of the area. The west end staging yard is now in service and 4 tracks are in place. During the last op session, 2 trains went west from Hollister Yard for the first time. Below are a couple of shots of the staging yard. Eventually there will be 12 tracks in both the east and west staging yards. This will have a significant impact on operations on the layout, and I'm looking forward to adding equipment and revising the operating scheme as new staging tracks enter service. I'm reasonably pleased with the way the scenery turned out in this area. Additional small details will be added over time, but for now, the project is finished. The biggest improvement is the addition of the west end staging yard, and it's nice to finally have it in operation.